The sudden intense urge to devour every sugary treat in sight around 3 p.m. every day is not a myth, it’s a fact. 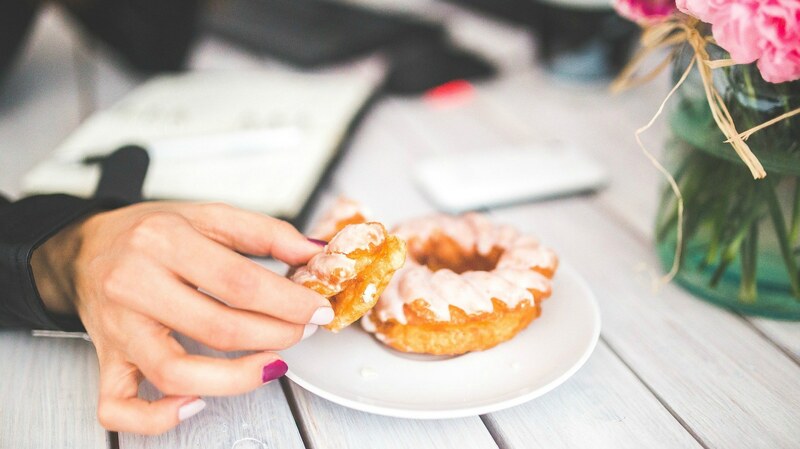 Those doughnut cravings are no joke — and they’re actually a primal urge. Turns out our craving for sweets goes back to the Stone Age, way before glorious glazed rings with sprinkles were even invented. Well, then. Our ancestors really screwed us on that one. But the good news is we can get some satisfaction from eating other types of foods to help curb our sugar cravings — and start feeling better on a day-to-day basis in the process. What does too much sugar do to your body? For one, it ages you. According to research published in the journal Cell in 2016, too much sugar will lower your immune system response, increasing inflammation and leading to essential mineral deficiencies in the body and feeding bad bacteria growth in your gut. Consuming too much sugar also disrupts normal brain function. A 2002 study conducted by the Department of Physiological Science at the University of California at Los Angeles found that a diet high in added sugar reduces the production of brain-derived neurotrophic factor, and without it, our brains cannot form new memories and it’s more difficult to learn and retain information. Sugar may also cause dementia and depression according to a 2007 study from the Centre of Inflammation and Metabolism. To top it all off, sugar can lead to obesity, which increases one’s risk of diabetes, according to a 2013 study published in PLOS. If you exercise regularly (and you’re relatively young), you’re able to burn off the extra sugar you may eat. But if you’re mostly inactive, the response to high levels of blood sugar (or glucose) is that the body releases more insulin into your bloodstream. Insulin (which regulates glucose levels in the blood) takes the surplus blood sugar and tries to find a place to store it. But if your muscles are full, then it places the excess glucose in your fat cells, according to a National Institutes of Health study in 2010. With frequent insulin spikes comes insulin resistance, leading to more insulin production, more fat storage and more resistance, eventually going down the road of possible diabetes. So if sugar is so bad for me, why do I crave it? The body interprets a lack of sugar (and high-carb foods) as a nutritional deficiency, creating insatiable cravings. At the core of every chocolate bar is the cacao bean. Cacao beans are loaded with magnesium, an essential nutrient that helps combat stress and avoid early heart attacks, says Dr. Bella Altura of the New York’s Downstate Medical Center in Brooklyn. “Stress indirectly causes the body to excrete magnesium, which causes an imbalance that can constrict the heart.” Depleted magnesium levels have also been associated with elevated blood pressure, according to a 2015 study published in the journal Nutrients. Often at the core of the cravings dilemma are modern food processing methods that remove most essential nutrients. Trying to fuel our bodies with processed foods almost guarantees continued sugar cravings. These cravings often lead to overeating — and weight gain. And the nutrients our bodies have been designed to seek in certain foods make us crave foods that are less and less nutritious, creating even stronger cravings! Is there a way to tame this sugar monster? Eat plants grown in rich, organic soil — sweet potatoes, pumpkin and fresh corn can help satisfy your sweet tooth. If you go for chocolate, eat only dark 70 percent-plus cocoa. It has less sugar and fat than a typical candy bar and may be good for the heart. Make your own sweet snacks using maple syrup, honey, stevia and other natural sweeteners — and use much less of those ingredients than what the recipe calls for. And here are even more tips for tackling those cravings. Combine foods. Try putting together a sweet treat with a healthy one, such as dipping sliced fruit in caramel sauce, or eating a handful of nuts with some chocolate chips. Some people find that going cold turkey with sugar works, as their cravings diminish after several days. Others may still crave sugar but are able to train their taste buds to be satisfied with less. Get moving! Your cravings can be triggered by stress and anxiety. This is called emotional eating. Take a walk around the block to get your mind off the food you’re craving. There’s even evidence that brisk walking can help you eat fewer sweets. In a study published in the journal Appetite, those who took a 15-minute walk were half as likely to eat chocolate at their desks compared with participants who took a 15-minute rest. Snack regularly. Waiting too long between meals can set you up to go after sugary, fatty foods that cut your hunger but leave you empty every three to five hours. Keep your blood sugar stable with protein and fiber-rich foods like whole grains and produce, Moores says. Try eating snacks that combine a protein with a whole grain, such as reduced-fat cheese on whole-wheat crackers. Healthy snacks like this one can actually ward off sugar cravings and help you stick to your health resolutions. If you want to turn off your sugar cravings, you will have to be willing to manage your stress, change your eating habits and enrich your diet with vitamins, minerals and other healthy, natural supplements.